Today, the best veterinary care originates from the expertise of your primary care veterinarian, your dedication to your pet and the use of the best diagnostic testing available. As pet owners, veterinarians, licensed veterinary technicians, and experts in diagnostic imaging, our team at Bush Advanced Veterinary Imaging understand this. That is why our goal is to provide our clients with the valuable diagnostic information that only cutting-edge technology can provide. 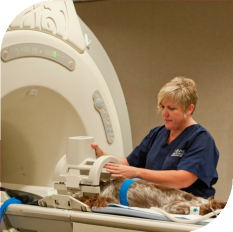 With five locations, on-site advanced diagnostics including MRI and a team of experienced veterinary staff members, we offer the best solution, the best technology and the best care. Please explore our site to learn more about imaging and about how to contact us to schedule an appointment.